If I asked you what games from 2006 you most wanted to see HD remasters of, you would be spoilt for choice. 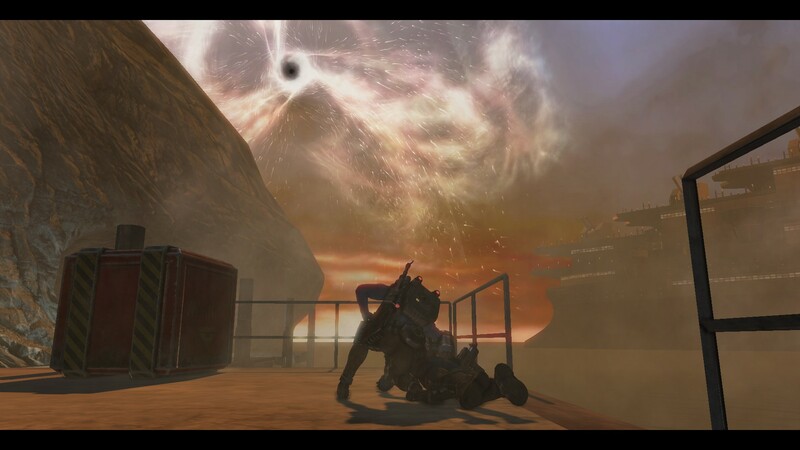 Burnout Revenge, Gun, God Hand, Battlefield 2142, Mashed all come to mind as games that would be a perfect fit for the modern day. 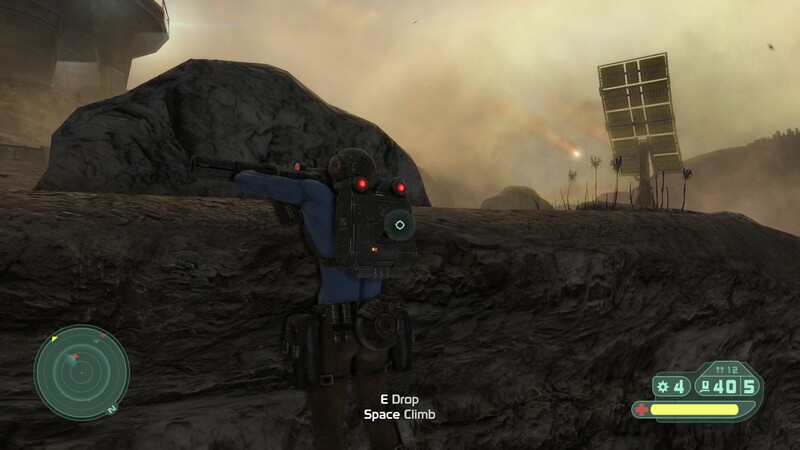 You probably wouldn't have mentioned Rogue Trooper, a third-person shooter from 2006 from Rebellion, based on the 2000 AD character of the same name that just missed the boat on the just-launched Xbox 360 and arrived on the PlayStation 2, Xbox, and Wii. Rogue Trooper was an uncomplicated run-and-gun blaster that provided fun but not that much more. Pushing aside the history lesson for a second, there's something immediately entertaining about playing Rogue Trooper, even 12 years later. The plot starts you off just as blue-skinned Genetic Infantry (G.I) trooper Rogue makes planetfall, tumbling out of a drop-pod and into the middle of a hellish war zone. Life (and death) comes at you pretty fast, and you're thrown into some heavy situations from the opening moments. The game's plot is simple, a revenge romp that sees Rogue betrayed and his G.I allies slaughtered. Rogue stomps off to get revenge with his dead squad mates, who live on as 'biochips' that preserve their personalities, as long as they're slotted into Rogue's equipment. This means your gun, backpack, and helmet all have their own personalities, and as Rogue spends most of the game fighting alone they also fill the role of your AI squad mates, cracking wise and offering tactical suggestions as you move through the game's five hours of campaign. It's not all talk, though. Rogue's equipment being inhabited by, at least in theory, intelligent humanity means that there's an in-character reason for mechanics like auto-aim, crafting, and 2006's favourite mechanic: standing next to a door while you wait for the security system to be unlocked. 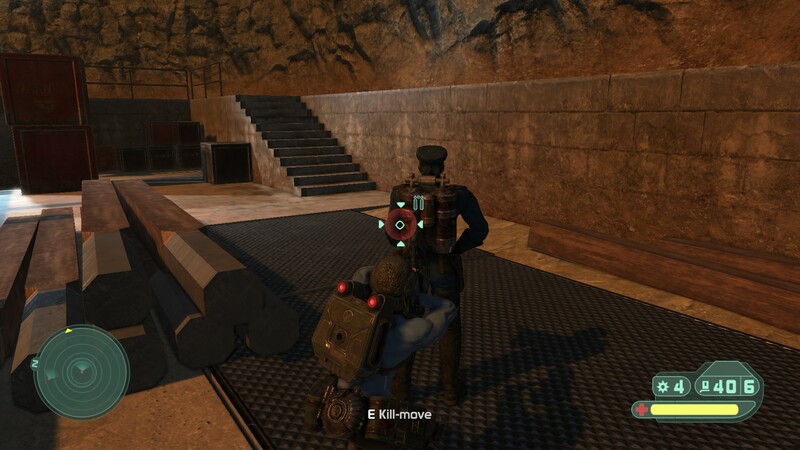 Defending doors from waves of enemies while you wait for them to be unlocked isn't the only 2006 mechanic that has been preserved in the remaster, although as Rogue Trooper Redux is little more than a textural upgrade and some spit and polish, that's to be expected. Take the game's upgrade system: You get salvage in piles, and also loot it from dead enemies. You use this to buy new ammo and upgrades using the salvage. Looting every enemy is tiresome, and the upgrades are boring, but you know, 2006. Hell, the cutscenes in the game don't seem to have been touched up much at all, and it's a showcase of slightly dodgy models and fuzzy visuals. 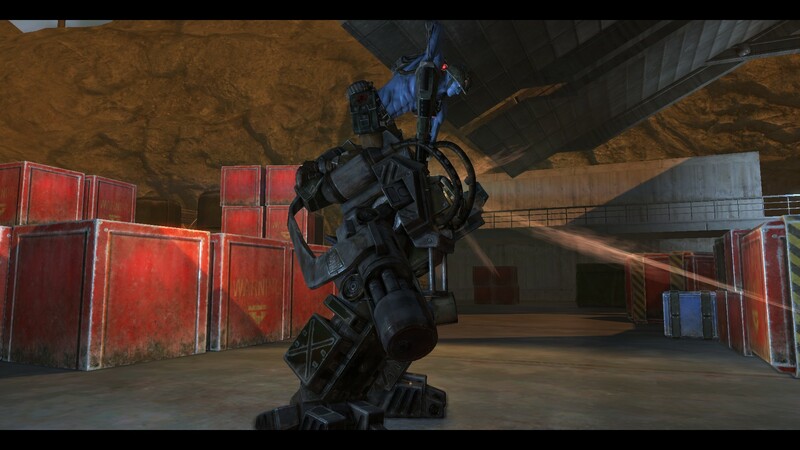 Still, look past the wrinkles and Rogue Trooper is entertaining enough, albeit limited. You'll spend most of the game heavily armed and prowling through small spaces, taking down the Nort forces that assault you from all sides. While most of the enemies have only minor cosmetic differences, and are all weak to being shot in the head or the oxygen tank they all have strapped to their back, many of the unusual enemies stuck in my head for a while. They're all cliched in a manner of speaking: the death-drones coming from the sky to cut you to pieces, the giant mech, the sentry guns. There's a flair to it, though: Sentry guns don't just appear, they fall to earth from the sky, bulletproof dustbins with a winking red light. With the cramped, brown-grey environments and many enemies fighting you with the same strategy, a lot of the variance in combat comes from the weapons and gadgetry you get to play with. 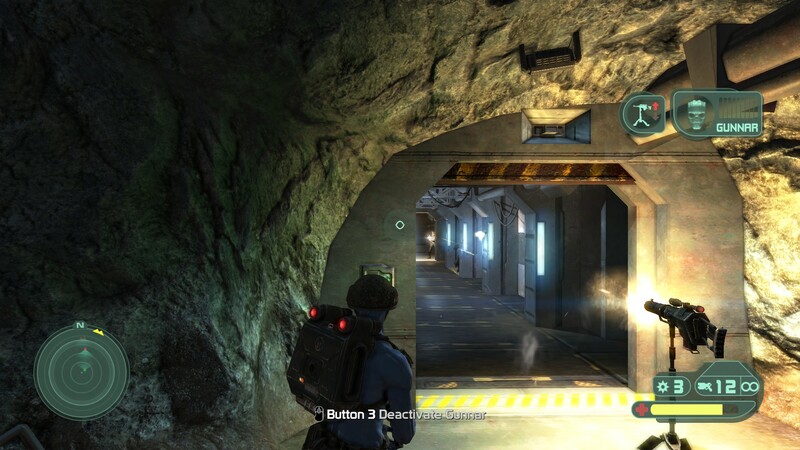 By the end of the first level you're well equipped, with gadgets that let you approach decisions in new ways: There's a range of grenades, a couple of different holograms that mislead enemies, and micro-mines that fire off from your back and spray the area in front of you. The weapons you're given are a bit of a disappointment, the FPS greatest hits collection, with an unlimited-ammo pistol, a big machine gun, and a couple of different underslung weapons. While the shotgun and pistol both feel punchy, it takes an era to switch guns, so for most of the game I was stuck behind the barrel of the machine gun just for ease. Outside of the campaign, there are a few different modes: a horde mode and a multiplayer variation of the same. The combat really isn't satisfying enough to make this a big draw for casual players, but fans of the game or the comic book will appreciate more of a chance to get stuck in when they're finished with the main event. While Rogue Trooper is a lot of fun at times, there's no escaping the problems that come from the fact you're playing a 12-year-old game. At the risk of repeating myself, Rogue Trooper is a good game, with many flashes of brilliance throughout, but it's constrained both by the technology of the time and the game design of the era. It's not my intention to dunk on a game for being old, but if you're not a fan, this remake feels unnecessary. Regardless, I had a blast going through the game despite the flaws. Writing this, Rogue Trooper is reminiscent of an ageing grandpa. The grandpa has a story to tell, and you'll feel glad you visited him this last time, but he refuses to use a DVD player and keeps pointing at new technological advances with a stern look on his face. 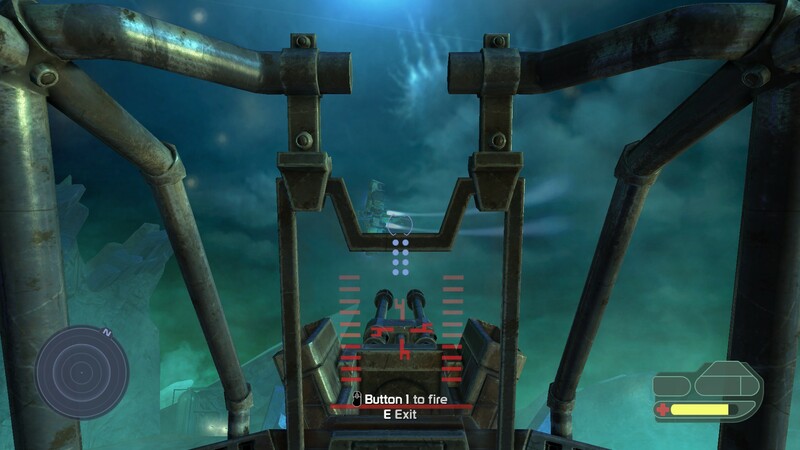 Rogue Trooper evades a bin award, with plucky design choices and inescapable charm letting the game punch above its weight, but Rogue Trooper was a 7/10 game back in 2006, and the years haven't been kind. Still, if you're looking for a trip down memory lane, it's probably one of the only third-person shooters from 2006 that's worth playing. You know, ignoring Gears of War. We sit down for a cup of tea with Jason Kingsley, founder of Rebellion and the chairman of TIGA, The Independent Games Developers Association. We find out what he thinks the future holds for the UK games industry, as well as what the challenges facing new companies.